The first single-volume history of Istanbul in decades: a biography of the city at the center of civilizations past and present. For more than two millennia Istanbul has stood at the crossroads of the world, perched at the very tip of Europe, gazing across the shores of Asia. The history of this city-known as Byzantium, then Constantinople, now Istanbul-is at once glorious, outsized, and astounding. Founded by the Greeks, its location blessed it as a center for trade but also made it a target of every empire in history, from Alexander the Great and his Macedonian Empire to the Romans and later the Ottomans. At its most spectacular Emperor Constantine I re-founded the city as New Rome, the capital of the eastern Roman Empire, and dramatically expanded the city, filling it with artistic treasures, and adorning the streets with opulent palaces. Around it all Constantine built new walls, truly impregnable, that preserved power, wealth, and withstood any aggressor-walls that still stand for tourists to visit. From its ancient past to the present, we meet the city through its ordinary citizens-the Jews, Muslims, Italians, Greeks, and Russians who used the famous baths and walked the bazaars-and the rulers who built it up and then destroyed it, including Mustafa Kemal Ataturk, the man who christened the city "Istanbul" in 1930. 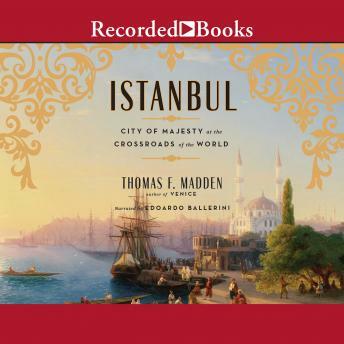 Thomas Madden's entertaining narrative brings to life the city we see today, including the rich splendor of the churches and monasteries that spread throughout the city. Istanbul draws on a lifetime of study and the latest scholarship, transporting readers to a city of unparalleled importance and majesty that holds the key to understanding modern civilization. In the words of Napoleon Bonaparte, "If the Earth were a single state, Istanbul would be its capital."